Xiaomi Product Director Wang Teng posted a simple photo on Weibo, showcasing some bottles in the discussion room at the Beijing HQ. 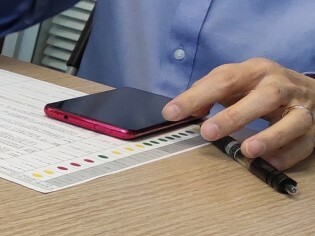 However, in the background, a device with a pop-up camera was spotted, and later the post was deleted from the social media. Of course, you can�t merely click Delete and remove something off the internet, so check out the device in the background. Our Chinese is shoddy when a piece of paper is angled, upside-down and on an digitally zoomed image, but we are probably looking at features listed as �good to go�, �needs a fine tune�, �doesn�t work at all� in the whole green-yellow-red circle system, which is something a company would do if a new product is on the way.